Dr. Andrew Baron is an Associate Professor in the Department of Psychology at the University of British Columbia. 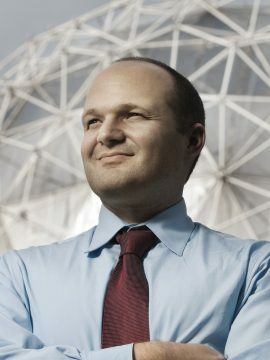 Baron is the founder and director of the Living Lab at Science World and the Social Cognitive Development Lab. Dr. Baron is also part of the Early Development Research Group, a consortium of six research centers interested in the development of language, learning, and social understanding in infants and children. My research explores the development of social cognition with a particular emphasis on characterizing the mechanisms (cultural and cognitive) that shape the acquisition and development of implicit intergroup cognition (e.g., social category concepts, attitudes, stereotypes and identity). My lab also seeks to understand the representational building blocks that support the construction of social knowledge structures in children such as those that underlie intergroup prejudice. Reflecting the natural interconnections between areas of psychology, I recruit theories and methods from social, cognitive and developmental psychology to explore these issues. More broadly, my lab seeks to understand the mechanisms that constrain how implicit associations form and that govern the conditions under which they can be modified and will influence behavior. This work has broad applications for cognitive science, social cognition, education, legal and economic policy, as well as for marketing research. While much of my research focuses on children ages 3-10, I also explore related questions concerning the acquisition and development of implicit associations among infants, older children and adults. For a list of publications, visit Dr. Andrew Baron's website.